Another one of my favorites. And don’t let the name fool you…although it is dark, it definitely isn’t dry (although it isn’t too sweet either). Their new packaging is pretty nifty too. Description on Bottle: Savor this refreshing glass of complexity. Dark & Dry’s assertive tartness is pleasingly balanced by a hint of molasses and brown sugar. More rounded and intricate than its sister ciders, this potion will appeal to beer aficionados, wine devotees, and cider enthusiasts alike. How Found: I think I originally found this just by browsing. Opinion: This is a tasty cider! I definitely pick up the molasses and brown sugar, and it has a rich & unique flavor. I really enjoy these dark complex sorts of ciders. There is a nice balance of dryness & sweetness. Its even better on tap than bottled, and I like it better out of a glass than the bottle. 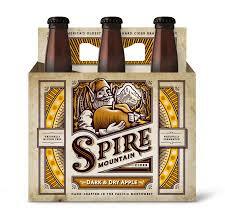 Spire Mountain also offer pear and plain apple varieties, which are also quite good, although I don’t like them quite as much as Dark & Dry. At the tasting I was at, at the Spire Mountain table, the Dark & Dry seemed to be the clear winner. The most similar cider I’ve had to this is Woodchuck 802, and I have to say that I like this one better…it seems more smooth and flavorful, and the 802 seems to have more acidity. Woodchuck 802 probably has more nationwide availability though, and I’d still recommend it. Highly recommended.